We put file numbers in all communications with our clients. However, we frequently begin dialogues with potential clients before opening a file for them. Then, once they become a client and we open a file, we have to go back and manually change each un-numbered email subject line. It's normally pretty easy to come up with a search term that finds all the emails that need changing, but it's time-consuming to change each one manually. Is there a way to batch insert a string that looks like  into the subject lines of all the emails in a search result and/or folder? Sure, you can do using VBA and a search folder by modifying the code sample at Copy: is prefixed to the Subject of a Meeting. If there are just a few subject lines to edit, you can use in-cell editing to quickly paste the code into the subject. Copy and paste the following code into the VB Editor. Create a search folder to find all messages where the subject needs tagged then run the macro while viewing the search folder results. I tested this code in Outlook 2010 and it should work in all older versions. 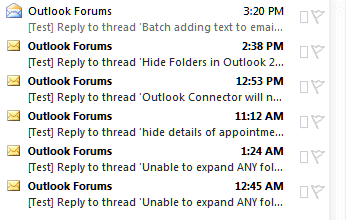 It works in Outlook 2013 and newer. MsgBox iItemsUpdated & " of " & mail.Items.Count & " Messages Updated"
When you run the macro, a dialog box will come up asking for the file number (it accepts any text string). Type your file number or keywords in then press OK or Enter. When the macro is finished, a message will come up showing you how many items were changed. Note: If you use this in Outlook 2010 and use Conversation view, the subject used for the conversation view won't change. Disable conversation view to see the updated subject lines on individual messages. Also, if the search results include sent messages, those subject lines will be updated too. This sample is a Run a Script rule and will add a number to each message as they arrive. It saves the last used number to the registry for use in the next session. To use, create a rule, choosing the run a script action and select this macro as the script. Jason wanted to add a project number and the path where the message is stored. To do this, I needed to add 2 1/2 lines to the original macro: Dim and Set the folder variable, then add the folder name variable to the subject. This code adds the code and folder path to the subject of every message in the folder. This version of the macro shows how to add the received date to the subject, with the date in a specific format. Rachid wanted to know how to use this macro with only the selected item. To run the macro on the selected message in the message list, replace the Set mail. line with the following line. If you want the macro to work on selected or open messages, use the GetCurrentItem Function from work with open or selected items and the code below. This code sample adds the ability to cancel the entry. To do this I changed Dim strFilenum As String to Dim strFilenum As Variant then added these the following lines. The first lines picks up the Cancel button, the second checks the value and if empty, exits. This version of the macro applies to selected messages. As written it increments the file number. Remove this line to use the same number. If you don't need to change a large number of items, it may be faster to use in-cell editing. Create a custom view or edit your existing view to enable in-cell editing then click in the subject field and paste the code. This macro shows how to use the first macro and the run a script macro. After testing the macro, create a button on the ribbon or Quick Access Toolbar (QAT) to make it easy to use. If you screwed up the macro, you can't hit Undo to fix it, but you can use another macro to restore the original subject. If the changes are at the beginning or end of the macro and are equal length you can use the Right or Left function to trim the subject. For identical keywords, you can use Replace (provided the keyword is not repeated in the subject). If the added keywords have a unique character (such as ]) or have the first space between the keyword and the original subject, use Instr function to calculate the length of the addition and Right (or Left) function to remove it. Joerg used this macro to remove a prefix where all added prefixes are the same length. Replace Right with Left to remove text from the end of a subject. This code snippet removes the text before the first space in the subject. If the added keywords vary in length or you made other changes to the subject, this macro reads the message header then uses regex to find the subject field and use it as the visible subject. Is there a way to modify the "Change the subject of the selected or open message" script to work on multiple selected emails? It's working perfectly but only on a single selection. Sure. It’s usually a minor tweak - I have an article that has code to work with either all mail in a folder or selected messages. It’s a matter of putting the working code in this macro into the ‘do something’ section in those macros. I’m on my iPad right now, but when I’m back on a computer I’ll try to remember to add a version that works on selected messages (instead of just all messages). I read a lot of your articles and want to thank you for all the great help! Now I am stuck with a problem I can't find a working solution for. Would you have any idea how to make this work? I tried to find out more about Imap-Protocoll, tried if I could use another data field which is supported by IMAP to manipulate, I tried modifying the subject and in the next step search for double emails and delete these, I tried all kinds of third party tools to achieve the same simple marking method and nothing works for us. I was trying to find a new imap protocoll for our mailserver that supports custom data fields but this did not work as well. Is there a way to reverse this or run another macro to remove the file no's. Any assistance you can provide would be apreciated. I'll see if i can find it - but you could use the conversation topic - it won't have the RE & FW though. Hi, this site is a great help. I have also used the 'Add ProjectNumber' Macro and I have done a mistake. I would be really interested how to i.e. delete the added string from all email headers or how to search&replace a specific string ? If the code was added on the left or right and is a specific # of characters, you can use .subect = right(.subject, len(.subject) - length-of-project#) use left if the code was added at the end. If the code length varies and you enclosed it in brackets, you need to use instr to find a bracket and calculate the length - or use regex to get the original subject from the header. I'm out of the office and on my iPad today so I can't get the code for that right now. Will try to remember to do it tonight. Great, I will try it. Its at the beginning in my case. Sorry I missed this early - but sure, you can use a macro - the one on this page will work with just a little tweaking. Now... this applies to all messages in the folder, so you don't want to run it multiple times on the same messages. It can be change to either use the conversation topic or only selected messages. Or use the run a script method to add the date as messages arrive. 2. " Test Subject Line"
3. " Test Subject Line"
4. " Test Subject Line"
you need to check the subject for [ and skip the keyword if it is found. Dear Diane, thanks for the tips. Is it possible to run the macro every time when a user wants to send a mail (before sending, so the subject is modified before sending? Can we make the popup window a combo box, which populates the field from an access database? If the connection is imap, and we make changes to the subject, it will be synced to the mailserver, right? Last question: if we want to run the script for recieving a message (with the sam combo box - acces mdb fields) and not generate an automatic number to them, what will happen when multiple emails arrive at the same time? Yes, you can run it automatically when you create a new message or when you click Send. You can also change it to be run manually when composing a message. You can use a dialog box and choose values that are stored in a database. If you aren't using auto generated numbers, you'll need to use a handler to insure some messages aren't skipped. I’ve looked through this thread; it is the closest to what I am trying to achieve. Apologies if I’ve missed a solution previously posted. I receive multiple monthly notification e-mails with identical subject lines for different accounts. I have a rule that moves them all into one folder, but have to manually append the subject with identifying text to signify each account. Sorry I missed this earlier. if the list of accounts/names is pretty static, you can use an array to handle the lookup. If you need to constantly update the list, it gets tiresome. A sample array is here - https://www.slipstick.com/developer/using-arrays-outlook-macros/ - it adds categories based on the subject but can easily add a word to the subject. To find the string in the body, you'll either use regex or instr/mid function. I have a code sample here somewhere that does something similar, but moves the messages to a folder - i'll see if I can find it.